The Night of the Long Knives (German: Nacht der langen Messer) or "Operation Hummingbird," took place in Nazi Germany between June 30 and July 2, 1934, when the Nazi regime executed at least 85 people for political reasons. Most of those killed were members of the "Storm Battalion" (SA) (German: Sturmabteilung), a Nazi paramilitary organization. Adolf Hitler moved against the SA and its leader, Ernst Röhm, because he saw the independence of the SA and the penchant of its members for street violence as a direct threat to his power. Hitler also wanted to forestall any move by leaders of the Reichswehr, the German military, who both feared and despised the SA, to curtail his rule, especially since Röhm made no secret of his ambition to absorb the Reichswehr with himself at its head. Finally, Hitler used the purge to act against conservative critics of his regime, especially those loyal to Vice-Chancellor Franz von Papen, and to settle scores with old enemies. At least 85 people died during the purge, although the final death toll may have been in the hundreds, and more than a thousand perceived opponents were arrested. Most of the killings were carried out by the Schutzstaffel (SS), an elite Nazi corps, and the Gestapo (Geheime Staatspolizei), the regime's secret police. The purge strengthened and consolidated the support of the Reichswehr for Hitler. It also provided a cloak of legality for the Nazi regime, as the German courts and cabinet quickly swept aside centuries of legal prohibition against extra-judicial killings to demonstrate their loyalty to the regime. Before its execution, its planners sometimes referred to it as "Hummingbird" (German: Kolibri), as that was the codeword used to set the execution squads in motion on the day of the purge. The codename for the operation appears to have been chosen arbitrarily. The phrase "Night of the Long Knives" in the German language predates the massacre itself, and it also refers generally to acts of vengeance. Its origin might be the "Night of the Long Knives," a massacre of Vortigern's men by Angle, Jute, and Saxon mercenaries in Arthurian myth. To this day, Germans still use the term "Röhm-Putsch" to describe the event, as that was the term the Nazi regime introduced into the language at the time, despite its false implication that the murders were necessary to forestall a coup. To emphasize this, German authors often use quotation marks or write about the so-called Röhm-Putsch. Hitler posing with SA members in the late 1920s; Hermann Göring (who would turn against the SA) is pictured beneath Hitler, wearing medals. President Paul von Hindenburg appointed Hitler chancellor on January 30, 1933. Over the next few months, Hitler eliminated all rival political parties in Germany, so that by the summer of 1933, the country had become a one-party state under his direction and control. However, despite his swift consolidation of political authority, Hitler did not exercise absolute power. As chancellor, Hitler did not command the army, which remained under the formal leadership of Hindenburg as its commander-in-chief. While many officers were impressed by Hitler's promises of an expanded army, a return to conscription, and a more aggressive foreign policy, the army continued to guard its traditions of independence during the early years of the Nazi regime. To a lesser extent, the Sturmabteilung (SA), a Nazi paramilitary organization, remained somewhat autonomous within the party itself. During the 1920s and 1930s, the SA functioned as a private militia that Hitler used to intimidate rivals and disrupt the meetings of competing political parties, especially those of the Social Democrats and the Communists. Also known as the "brownshirts" or "stormtroopers," the SA became notorious for their street battles with the Communists. The violent confrontations between the two groups contributed to the destabilization of Germany's inter-war experiment with democracy, the Weimar Republic. In June 1932, one of the worst months of political violence, there were over 400 street battles, resulting in 82 deaths. This very destabilization had been crucial in Hitler's rise to power, however, not the least because it convinced many Germans that once Hitler became chancellor, the endemic street violence would end. Hitler's appointment as chancellor, followed by the suppression of all political parties except the Nazis, curtailed but did not end the violence of the stormtroopers. Deprived of Communist party meetings to disrupt, but inured to—and seduced by—violence, the stormtroopers would sometimes run riot in German streets after a night of drinking. Very often they would beat up passers-by, and then attack the police who were called to stop them. Complaints of "overbearing and loutish" behavior by stormtroopers were common by the summer of 1933. Even the Foreign Office complained of instances of brownshirts manhandling foreign diplomats. Such behavior disturbed the German middle classes and other conservative elements in society, such as the army. Hitler's next move would be to strengthen his position with the army by moving against its nemesis, the SA. On July 6, 1933, at a gathering of high-ranking Nazi officials, Hitler declared the success of the National Socialist, or Nazi, revolution. Now that the Nazi party had seized the reins of power in Germany, he said, it was time to consolidate its hold. As Hitler told the gathered officials, "The stream of revolution has been undammed, but it must be channeled into the secure bed of evolution." Hitler's speech signaled his intention to rein in the SA, whose ranks had grown rapidly in the early 1930s. This would not prove to be a simple task, however, as the SA constituted a large part of the most devoted followers of Nazism. The SA traced its dramatic rise in numbers in part to the onset of the Great Depression, when many Germans lost faith in traditional institutions. While Nazism was not exclusively—or even primarily—a working class phenomenon, the SA fulfilled the yearning of many workers for both class solidarity and nationalist fervor. Many stormtroopers believed in the socialist promise of National Socialism and expected the Nazi regime to take more radical economic action, such as breaking up the vast landed estates of the aristocracy. That the regime did not take such steps disillusioned those who expected an economic as well as a political revolution. Minister of Defense Werner von Blomberg, a conservative Prussian general who led army opposition to Röhm and the SA. No one in the SA spoke more loudly for "a continuation of the German revolution," as one prominent stormtrooper put it, than Röhm. As one of the earliest members of the Nazi party, Röhm had participated in the Beer Hall Putsch, an unsuccessful attempt by Hitler to seize power by force in 1923. A combat veteran of World War I, Röhm had recently boasted that he would execute 12 men in retaliation for the killing of any stormtrooper. Röhm saw violence as a means to political ends. He took seriously the socialist promise of National Socialism, and demanded that Hitler and the other party leaders initiate wide-ranging socialist reform in Germany. Not content solely with the leadership of the SA, Röhm lobbied Hitler to appoint him Minister of Defense, a position held by the conservative General Werner von Blomberg. Although nicknamed the "Rubber Lion" by some of his critics in the army for his devotion to Hitler, Blomberg was not himself a Nazi, and therefore represented a bridge between the army and the party. Blomberg and many of his fellow officers were recruited from the Prussian nobility, and regarded the SA as a plebeian rabble that threatened the army's traditional high status in German society. Despite such hostility between the brownshirts and the regular army, Blomberg and others in the military saw the SA as a source of raw recruits for an enlarged and revitalized army. Röhm, however, wanted to eliminate the generalship of the Prussian aristocracy altogether, using the SA to become the core of a new German military. Limited by the Treaty of Versailles to one hundred thousand soldiers, army leaders watched anxiously as membership in the SA surpassed three million men by the beginning of 1934. In January 1934, Röhm presented Blomberg with a memorandum demanding that the SA replace the regular army as the nation's ground forces, and that the Reichswehr become a training adjunct to the SA. In response, Hitler met with Blomberg and the leadership of the SA and SS on February 28, 1934. Under pressure from Hitler, Röhm reluctantly signed a pledge stating that he recognized the supremacy of the Reichswehr over the SA. Hitler announced to those present that the SA would act as an auxiliary to the Reichswehr, not the other way around. After Hitler and most of the army officers had left, however, Röhm declared that he would not take instructions from "the ridiculous corporal"—a demeaning reference to Hitler. While Hitler did not take immediate action against Röhm for his intemperate outburst, it nonetheless deepened the rift between them. Franz von Papen, the conservative vice-chancellor who ran afoul of Hitler after denouncing the regime's failure to rein in the SA in his Marburg speech. Despite his earlier agreement with Hitler, Röhm still clung to his vision of a new German army with the SA at its core. By the spring of 1934, this vision directly conflicted with Hitler's plan to consolidate power and expand the Reichswehr. Because their plans for the army were mutually exclusive, Röhm's success could only come at Hitler's expense. As a result, a political struggle within the party grew, with those closest to Hitler, including Prussian premier Hermann Göring, Propaganda Minister Joseph Goebbels, SS Chief Heinrich Himmler, and Hitler's deputy Rudolf Hess, arraying themselves against Röhm. While all of these men were veterans of the Nazi movement, only Röhm continued to demonstrate his independence from, rather than his loyalty to, Adolf Hitler. Röhm's contempt for the party's bureaucracy angered Hess. SA violence in Prussia gravely concerned Göring, Minister-President of Prussia. As a means of isolating Röhm, on April 20, 1934, Göring transferred control of the Prussian political police to Himmler, who, Göring believed, could be counted on to move against Röhm. Himmler envied the independence and power of the SA, although at the time he had already begun the restructuring of the SS from a bodyguard of Nazi leaders into an elite corps loyal to both himself and Hitler. That loyalty would prove useful to both men when Hitler chose to move against Röhm and the SA. Demands for Hitler to constrain the SA strengthened. Conservatives in the army, industry, and politics placed Hitler under increasing pressure to reduce the influence of the SA and to move against Röhm. While Röhm's homosexuality did not endear him to conservatives, they were more concerned about his political ambitions. 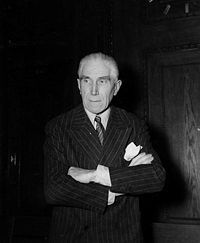 On June 17, 1934, conservative demands for Hitler to act came to a head when Vice-Chancellor Franz von Papen, confidant of the ailing Hindenburg, gave a speech at Marburg University warning of the threat of a "second revolution." Privately, von Papen, a Catholic aristocrat with ties to army and industry, threatened to resign if Hitler did not act. While von Papen's resignation as vice-chancellor would not threaten Hitler's position, it would nonetheless be an embarrassing display of independence from a leading conservative. In response to conservative pressure to constrain Röhm, Hitler left for Neudeck to meet with Hindenburg. Blomberg, who had been meeting with the President, uncharacteristically reproached Hitler for not having moved against Röhm earlier. He then told Hitler that Hindenburg was close to declaring martial law and turning the government over to the Reichswehr if Hitler did not take immediate steps against Röhm and his brownshirts. Hitler had hesitated for months in moving against Röhm, in part due to Röhm's visibility as the leader of a national militia with millions of members. However, the threat of a declaration of martial law from Hindenburg, the only person in Germany with the authority to potentially depose the Nazi regime, put Hitler under pressure to act. He left Neudeck with the intention of both destroying Röhm, and settling scores with old enemies. Both Himmler and Göring welcomed Hitler's decision, since both had much to gain by Röhm's downfall—the independence of the SS for Himmler, and the removal of a rival for the future command of the army for Göring. In preparation for the purge, both Himmler and his deputy, Reinhard Heydrich, chief of the SS Security Service, assembled a dossier of manufactured evidence to suggest that Röhm had been paid twelve million marks by France to overthrow Hitler. Leading officers in the SS were shown falsified evidence on June 24, that Röhm planned to use the SA to launch a plot against the government (Röhm-Putsch). Meanwhile Göring and Himmler, at Hitler's direction, drew up lists of people outside the SA that they wanted killed. On June 27, Hitler moved to secure the army's cooperation. Blomberg and General Walther von Reichenau, the army's liaison to the party, gave it to him by expelling Röhm from the German Officers' League, and placing the army on alert. Hitler felt confident enough in his position to attend a wedding reception in Essen, although he appeared somewhat agitated and preoccupied. From there, he called Röhm's adjutant at Bad Wiessee and ordered SA leaders to meet with him on June 30. The architects of the purge: Hitler, Göring, Goebbels, and Hess. Only Himmler is missing. At about 4:30 on the morning of June 30, 1934, Hitler and his entourage flew into Munich. From the airport, they drove to the Bavarian Interior Ministry, where they assembled the leaders of an SA rampage that had taken place in city streets the night before. Enraged, Hitler tore the epaulets off the shirt of Obergruppenführer Schneidhuber, the Chief of the Munich Police, for failing to keep order in the city on the previous night. He shouted at him that he would be shot. As the stormtroopers were hustled off to prison, Hitler assembled a large group of SS and regular police, and departed for the Hanselbauer Hotel in Bad Wiessee, where Röhm and his followers were staying. At Bad Wiessee, Hitler personally placed Röhm and other high-ranking SA leaders under arrest. According to Erich Kempka, one of the men present during the raid, Hitler turned Röhm over to "two detectives holding pistols with the safety catch removed," and the SS found Breslau SA leader, Edmund Heines, in bed with an eighteen-year-old SA Senior Troop leader. Goebbels would emphasize the latter in subsequent propaganda, justifying the purge as a crackdown on moral turpitude. Both Heines and his partner were shot on the spot in the hotel grounds on the personal order of Hitler. Meanwhile, the SS arrested a number of SA leaders as they departed their train for a planned meeting with Röhm. The fact that no plot by Röhm to overthrow the regime ever existed did not prevent Hitler from denouncing the leadership of the SA. Arriving back at party headquarters in Munich, Hitler addressed the assembled crowd. Consumed with rage, Hitler denounced "the worst treachery in world history." 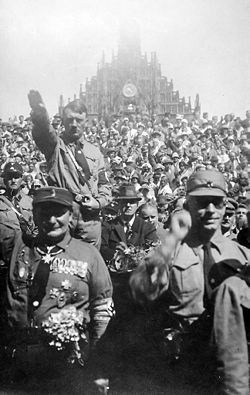 Hitler told the crowd that "undisciplined and disobedient characters, and asocial or diseased elements" would be annihilated. The crowd, which included party members and many SA members fortunate enough to escape arrest, shouted its approval. Hess, present among the assembled, even volunteered to shoot the "traitors" himself. Goebbels, who had been with Hitler at Bad Wiessee, set the final phase of the plan in motion. Upon returning to Berlin, he telephoned Göring with the codeword Kolibri to loose the execution squads on the rest of their unsuspecting victims. The regime did not limit itself to a purge of the SA, however. Having earlier imprisoned or exiled prominent Social Democrats and Communists, Hitler used the occasion to move against conservatives he considered unreliable. This included Vice-Chancellor Papen and those in his immediate circle. In Berlin, on Göring's personal orders, an armed SS unit stormed the Vice-Chancellery. Gestapo officers attached to the SS unit shot Papen's secretary, Herbert von Bose, without bothering to arrest him first. The Gestapo arrested and later executed Papen's close associate, Edgar Jung, the author of the Marburg speech; they disposed of his body by dumping it in a ditch. The Gestapo also murdered Erich Klausener, the leader of Catholic Action, and a close Papen associate. The vice-chancellor himself was unceremoniously arrested at the vice-chancellery, despite his insistent protests that he could not be arrested. Although Hitler ordered him released days later, Papen would no longer dare to criticize the regime. Hitler, Göring, and Himmler unleashed the Gestapo against old enemies as well. Both Kurt von Schleicher, Hitler's predecessor as chancellor, and his wife were murdered at their home. Others killed included Gregor Strasser, a former Nazi who had angered Hitler by resigning from the party in 1932, and Gustav Ritter von Kahr, the former Bavarian state commissioner who crushed the Beer Hall Putsch in 1923. Kahr's fate was especially gruesome. His body was found in a wood outside Munich; he had been hacked to death, apparently by pickaxes. The murdered included at least one accidental victim: Willi Schmid, the music critic of the Münchner Neuste Nachrichten, a Munich newspaper. The Gestapo mistook him for Ludwig Schmitt, a past supporter of Otto Strasser, the brother of Gregor. Such relentless violence did much to add to the fearsome reputation of the Gestapo as the Nazis' secret police. Röhm was held briefly at Stadelheim Prison in Munich, while Hitler considered his fate. Certainly, Röhm's service to the Nazi regime counted for something. On the other hand, he could not be held in prison indefinitely or exiled, and a public trial might bring unwanted scrutiny to the purge. In the end, Hitler decided that Röhm had to die. On July 2, at Hitler's behest, Theodor Eicke, the later commandant of the Dachau concentration camp, and SS Officer Michel Lippert visited Röhm. Once inside Röhm's cell, they handed him a loaded Browning pistol and told him that he had ten minutes to kill himself, or else they would do it for him. Röhm demurred, telling them, "If I am to be killed, let Adolf do it himself." Having heard nothing in the allotted time, they returned to Röhm's cell to find him standing with his bare chest puffed out in a gesture of defiance. Lippert shot him to death at point-blank range. Years later, in 1957, the German authorities tried Lippert in Munich for Röhm's murder. He was one of the few executioners of the purge not to have escaped justice. Hitler triumphant: The Führer reviewing SA in 1935. 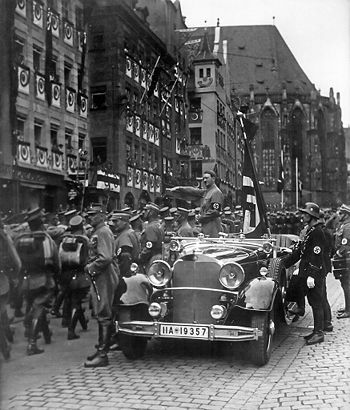 An SS soldier stands by the car, on Hitler's left. In this hour I was responsible for the fate of the German people, and thereby I became the supreme judge of the German people. I gave the order to shoot the ringleaders in this treason, and I further gave the order to cauterize down to the raw flesh the ulcers of this poisoning of the wells in our domestic life. Let the nation know that its existence—which depends on its internal order and security—cannot be threatened with impunity by anyone! And let it be known for all time to come that if anyone raises his hand to strike the State, then certain death is his lot. Concerned with presenting the massacre as legally sanctioned, Hitler had the cabinet approve a measure, on July 3, that declared, "The measures taken on June 30, July 1 and 2 to suppress treasonous assaults are legal as acts of self-defense by the State." Reich Justice Minister Franz Gürtner, a conservative who had been Bavarian Justice Minister in the years of the Weimar Republic, demonstrated his loyalty to the new regime by drafting the statute, which added a legal veneer to the purge. Signed into law by both Hitler and Minister of the Interior Wilhelm Frick, the "Law Regarding Measures of State Self-Defense" retrospectively legalized the murders committed during the purge. Germany's legal establishment further capitulated to the regime when the country's leading legal scholar, Carl Schmitt, wrote an article defending Hitler's July 13 speech. It was named "The Führer Upholds the Law." With almost complete unanimity, the army applauded the Night of the Long Knives, despite the fact that it had resulted in the death of two of its generals, Kurt von Schleicher and Ferdinand von Bredow. The ailing President Hindenburg, Germany's most revered military hero, sent a telegram expressing his "profoundly felt gratitude." General von Reichenau went so far as to publicly give credence to the lie that Schleicher had been plotting to overthrow the government. The army's support for the purge, however, would have far-reaching consequences for the institution. The humbling of the SA ended the threat it had posed to the army but, by standing by Hitler during the purge, the army bound itself more tightly to the Nazi regime. One retired captain, Erwin Planck, seemed to realize this. "If you look on without lifting a finger," he said to his friend, General Werner von Fritsch, "you will meet the same fate sooner or later." 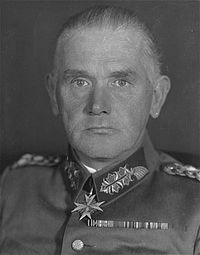 Another rare exception was Field Marshal August von Mackensen, who spoke about the murders of Schleicher and Bredow at the annual General Staff Society meeting in February of 1935. Without an independent press to report on the events of the purge, rumors about the "Night of the Long Knives" rapidly spread. Many Germans approached the official news of the events as described by Joseph Goebbels with a great deal of skepticism. At the same time, however, many others seemed prepared to take the regime at its word, and to believe that Hitler had saved Germany from a descent into chaos. Luise Solmitz, a Hamburg schoolteacher, echoed the sentiments of many Germans when she cited Hitler's "personal courage, decisiveness, and effectiveness" in her private diary. She even compared him to Frederick the Great, the legendary King of Prussia. Others were appalled at the scale of the executions and at the relative complacency of many of their fellow Germans. "A very calm and easygoing mailman," the diarist Victor Klemperer wrote, "who is not at all National Socialist, said, 'Well, he simply sentenced them.'" It did not escape Klemperer's notice that many of the victims had played a role in bringing Hitler to power. "A chancellor," he wrote, "sentences and shoots members of his own private army!" The extent of the massacre and the relative ubiquity of the Gestapo, however, meant that those who disapproved of the purge generally kept quiet about it. Hitler named Victor Lutze to replace Röhm as head of the SA. Hitler ordered him, as one prominent historian described it, to put an end to "homosexuality, debauchery, drunkenness, and high living" in the SA. Hitler expressly told him to stop SA funds from being spent on limousines and banquets, which he considered evidence of SA extravagance. A weak man, Lutze did little to assert the SA's independence in the coming years, and the SA gradually lost its power in Hitler's Germany. The regime had all of the decorative SA daggers ground to remove the name of Röhm from the blade, which was replaced with the words Blut und Ehre ("blood and honor"). Membership in the organization plummeted from 2.9 million in August 1934 to 1.2 million in April 1938. ↑ Evans (2005), p. 39. ↑ Kershaw, Hitler (1999), p. 515. ↑ Deutsches Historisches Museum (DHM), "Röhm-Putsch." Retrieved October 14, 2007. ↑ Reiche (2002), p. 120–121. ↑ Kershaw, Hitler (1999), p. 501. ↑ Kershaw, Hitler (1999), p. 435. ↑ Schoenbaum (1997), p. 35–42. ↑ Frei (1987), p. 126. ↑ Wheeler-Bennett (2005), p. 712–739. ↑ Papen (1953), p. 308–312. ↑ Wheeler-Bennett (2005), p. 319–320. ↑ Evans (2005), p. 31. ↑ O'Neill (1967), p. 72–80. ↑ Shirer (1960), p. 221. ↑ Kershaw, Hitler (1999), p. 514. ↑ Evans (2005), p. 33–34. ↑ Spielvogel (2005), p. 78–79. ↑ Evans (2005), p. 36. ↑ Joachim Fest, Hitler (Harcourt, 1974). ↑ Kershaw, Hitler (1999), p. 517. ↑ Richard Evans, The Third Reich in Power (Penguin Group, 2005), p. 72. ↑ Kershaw, Hitler (1999), p. 519. ↑ Höhne (1970), pp. 113–118. ↑ Kershaw, Myth (2001), p. 87. ↑ Kershaw, Hitler (1999), p. 520. ↑ Evans (2005), p. 72. Von Papen, Franz. Memoirs. London: Dutton, 1953. Evans, Richard J. The Coming of the Third Reich. New York: Penguin Group, 2004. ISBN 0-14-303469-3. All links retrieve December 3, 2018. The History Place—Triumph of Hitler—Night of the Long Knives. German Culture—The Third Reich—Consolidation of Power. The Holocaust Museum—The Third Reich. History of "Night of the Long Knives"
This page was last modified on 4 December 2018, at 00:15.